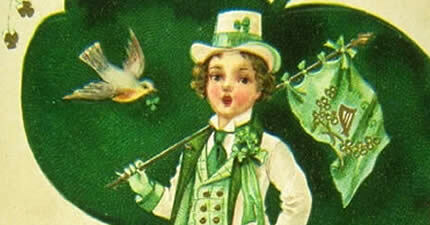 St. Patrick, the patron saint of Ireland, is one of Christianity's most widely known figures. But for all his celebrity, his life remains somewhat of a mystery. Many of the stories traditionally associated with St. Patrick, including the famous account of his banishing all the snakes from Ireland, are false, the products of hundreds of years of exaggerated storytelling. After more than six years as a prisoner, Patrick escaped. According to his writing, a voice—which he believed to be God's—spoke to him in a dream, telling him it was time to leave Ireland. Trackposted to Outside the Beltway, Blog @ MoreWhat.com, Perri Nelson's Website, The Virtuous Republic, 123beta, Adam's Blog, basil's blog, The Bullwinkle Blog, Phastidio.net, Conservative Cat, Jo's Cafe, Conservative Thoughts, Sujet- Celebrities, Rightlinx, third world county, Woman Honor Thyself, The Crazy Rants of Samantha Burns, , stikNstein... has no mercy, The World According to Carl, Blue Star Chronicles, Overtaken by Events, Pirate's Cove, The Pink Flamingo, Dumb Ox Daily News, and Right Voices, thanks to Linkfest Haven Deluxe.